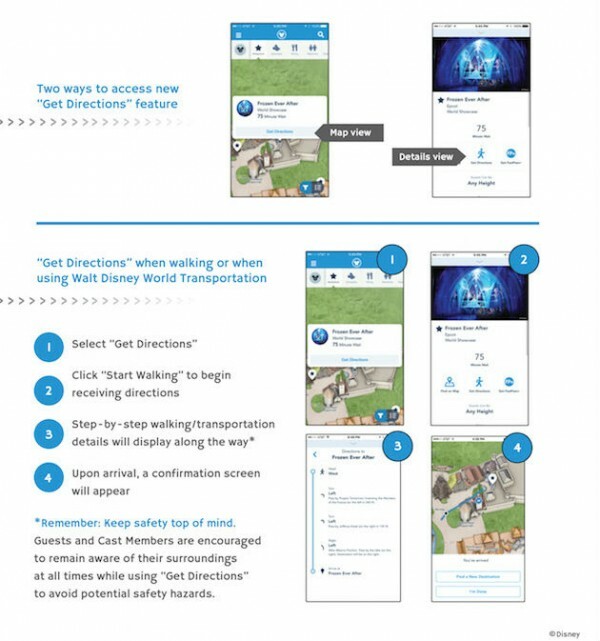 Beginning this week, you can navigate Walt Disney World® Resort with the help of “Get Directions” – a new way finding feature on the My Disney Experience mobile app*. “Get Directions” allows you to conveniently navigate to your favorite Walt Disney World destination whether walking or taking Walt Disney World Resort Transportation. Using GPS navigation, this new feature provides Guests with turn-by-turn walking directions to destinations across the Walt Disney World Resort including Theme Parks, Water Parks, select Walt Disney World Resort Hotels, Disney Springs and many other locations such as Restrooms, Guest Services, shopping locations and more. The “Get Directions” feature also provides information on transportation routes to and from Parks and select Walt Disney World Resort Hotels, along with bus, monorail and watercraft transit options. Just remember to remain aware of your surroundings at all times while using “Get Directions” to avoid potential safety hazards. You don’t want to accidentally walk into a popcorn cart. Click here to begin planning your next Disney Vacation! *Availability subject to device limitations and features may vary by device or service provider. Guests must enable location services on their device to use the functionality. Message, data and roaming rates may apply. Coverage and app stores not available everywhere. If you’re under 18, get your parent’s permission first. Valid Theme Park and online registration required. This entry was posted on July 21, 2016 at 8:32 am and is filed under Disney News, Disney Vacation Planning, Walt Disney World. You can follow any responses to this entry through the RSS 2.0 feed. You can leave a response or trackback from your own site.